The Board of Education in a school district is similar to what a board of directors is in a business. The primary functions of the Board are to develop the broader, longer-range goals and plans through the development of policies which determine the basic framework for educational programs, services and facilities to be offered to the youth of our community. NYS laws and regulations place the responsibility for carrying out educational mandates with a board of education. In order to be a member of the school board, you must: a) be at least 18 years old, b) be a United States citizen and c) live in the Churchville-Chili School District for at least one year prior to the election. 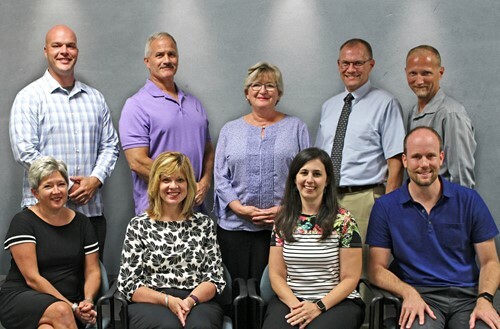 The Board of Education is made up of nine volunteer members from the community, three of whom who are elected each year by district voters for three-year terms. Public meetings are generally held on the second and fourth Tuesdays of each month at 7 p.m. in the Churchville-Chili District Office (unless advertised differently). The Board, which is sensitive to community aspirations, needs, and available resources, encourages employee participation and support for the schools. The decisions of your elected Board of Education affect your daily work and the well-being of your community. The Board urges your participation in such important matters and encourages the school district and the community to work together to provide the best possible educational program for students in the Churchville-Chili district. Privilege of the Floor at Board meetings: A visitor's form is available at the Board meetings where you sign in. Please complete the form and submit to our Assistant District Clerk, Mary Torcello. Approximately 20 minutes of a Board meeting will be set aside for visitor's comments, and the board respectfully requests that each person limit their floor time to 5 minutes to allow other members of the audience time to address the board. There is a privilege of the floor at the beginning and at the end of the meeting. Large groups with similar interest will be asked to select a spokesperson. When addressing the board, please be sure to omit names of individuals as to protect their privacy. If the situation cannot be expressed without the use of names, please contact Assistant District Clerk Mary Torcello at extension 2305 to determine if the issue warrants an executive session with the board. Please note that personal complaints should be referred to administration at each of the buildings for resolution prior to addressing the board. The President of the Board is empowered to restrict and/or suspend this privilege. Please note that unless specified otherwise, board meetings are held in the Administrative Offices located in the Middle School, in the Administrative Board Conference Room. You may enter through door #24 or #26.